Portsmouth claimed a shock victory as United paid the price for failing to convert any of their many chances. United had laid siege to the home side's goal early on but Pompey survived and hit back after the break. David Unsworth put them ahead from the spot after Rio Ferdinand tugged back Ricardo Fuller in the area. Cristiano Ronaldo hit the post with a header as United piled on the pressure but Yakubu finished them off when his shot deflected in off Mikael Silvestre. It was Pompey's second successive Premiership victory over United at Fratton Park - but it looked unlikely in the early stages. United came out with all guns blazing and Ronaldo had three opportunities without managing to test Shaka Hislop. Hislop also had to dive to parry Alan Smith's effort from the edge of the box, with Wayne Rooney just unable to reach the rebound. Smith then fired over and Paul Scholes arrowed a shot just wide to complete a whirlwind opening 20 minutes. But United could not maintain their pressure and Pompey slowly grew in confidence - and began to threaten themselves. Fuller battled his way down the right and into the area before feeding Lomana LuaLua but his shot was blocked on the line with Roy Carroll beaten. Amdy Faye's dipping shot also had to be tipped over by the United keeper as Pompey finished the half with a flourish. And United's failure to take their early chances looked even more costly when the home side who took the lead on 53 minutes. Fuller ran through into the box but had his shirt tugged back by Ferdinand, and Unsworth confidently despatched the resulting penalty. United's response was to pour forward and they almost levelled immediately. Ronaldo rose to meet Phil Neville's cross but his header came back off the post and Alan Smith ballooned the rebound high over the bar from a yard out. 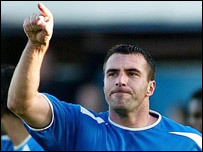 Rooney and Ronaldo wasted two more good openings for the visitors before Pompey sealed victory with their second goal. A long ball from Hislop found Yakubu and he ran at Ferdinand before letting fly with a shot that bounced off Silvestre and looped over Carroll into the net. United's efforts became more and more desperate, and in the end Portmouth held on comfortably for victory. Portsmouth: Hislop, Primus, De Zeeuw, Stefanovic, Unsworth, Quashie, Faye, Berger (Mezague 45), LuaLua, Kamara (Fuller 32), Yakubu. Subs Not Used: Ashdown, Griffin, Cisse. Goals: Unsworth 53 pen, Yakubu 72. Man Utd: Carroll, Gary Neville (Brown 80), Ferdinand, Silvestre, Heinze, Ronaldo, Phil Neville (Keane 65), Scholes, Giggs, Rooney, Smith (Saha 65). Subs Not Used: Miller, Ricardo. Ref: N Barry (N Lincolnshire).